Mood Pieces is a new recurring feature, where I introduce and review games that make an impression on me with their atmosphere, mood or theme. The first game in the series is a game called From Dust, which I first became aware through a Penny Arcade comic. Having been a Populous and Black & White fan, the idea of a modern god game intrigued me immediately. From Dust is available in Xbox Live Arcade, and later on it will be published in PlayStation Network and OnLive. The guy behind the game is Eric Chahi, whose previous work includes a true classic, Another World. The beginning of the game sets the tone in an impressive way. A small tribe of primitive people, wearing masks made of nacre and carrying simple tools, climb out of a cave to a small island in the middle of a churning sea. The first thing they do is to sing themselves a new god, Breath, which the player controls. From early on it’s clear that the opponent of the game are the forces of nature. 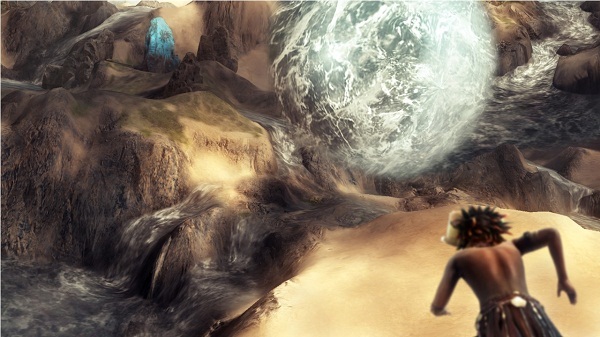 The main power of the player’s little godlet is to gather earth, water and lava into a huge sphere and to place it where the player wishes. The matter behaves in a way that’s kind of realistic, but simple enough to keep the gaming fun. Dirt doesn’t pile up very high, water flows across the ground and erodes loose dirt, and lava cools down to form solid rock that can be used to channel water or more lava. 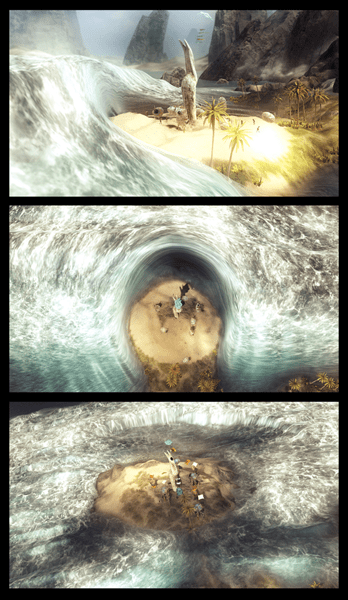 Right in the beginning the player has to save the tribe’s village from a tsunami by getting them to find a protective song. The tsunami is not just a gradual rise of sea level, but an enormous thundering wall of water that made me go “holy hell!” out aloud the first time I saw it. Seeing the wave smash against the protective circle created by the song and flow around the village was really something. Above all, From Dust is a fight against the forces of nature. From Dust is visually extremely beautiful, and its soundtrack is spot on. The game takes on a feel of a creation myth and a voyage that’s both spiritual and physical. The tribe advances from island to island, following the footsteps of the mysterious elders and reclaiming the lost knowledge of the past. 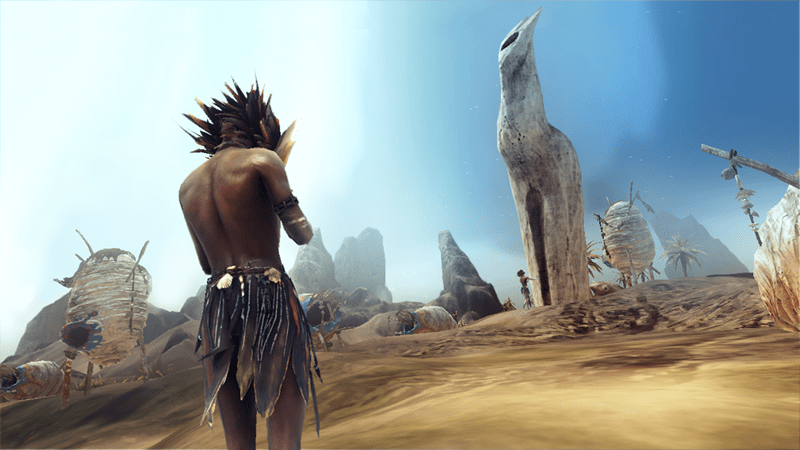 The creators of the game have researched African and New Guinean tribes for the game, and the digeridoo in the soundtrack adds a dash of Australian aborigine vibe. The voiceovers are done in an unknown language, spoken by an old man whose gravelly voice invokes a feel of a tribal shaman. According to Xbox Gaming in South Africa the language is a mix of Swahili and Malay. 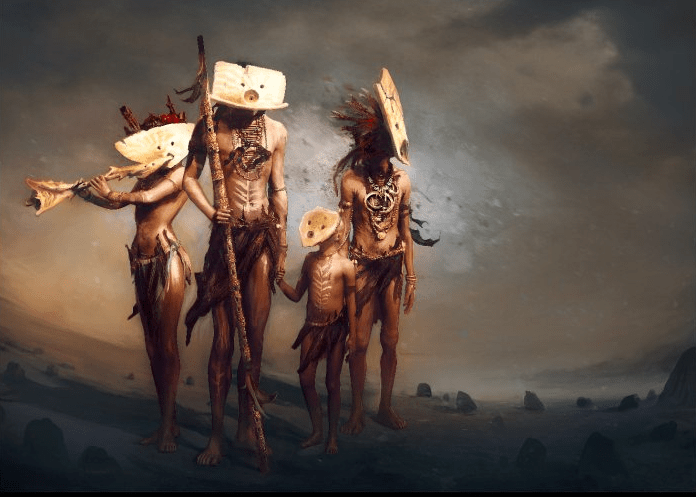 The central core mechanic of the game is to have the tribe build a village around each of the totems in the current part of the world. There is no micro managing resources or researching technologies, the only thing the player can do to the tribesmen is to tell them to move to a certain location. Building villages unlocks additional powers for the player, such as the ability to make the overall water level drop for a set duration, to quench all the fires raging around the world, or to jellify water which makes it possible split the waters of a river or a strait, and allow your people to pass through them. When all the totems in the current area have a village, the player can lead his tribe to the exit and through to the next world. In the end From Dust has more in common with a fast paced puzzle game than traditional god games, which are mostly about unhurried tinkering and playing in a sandbox. Tsunamis, volcanos, forest fires and other disasters threaten the tribe continuously, so the player has to react really fast to protect them. Most of the levels seem to have only one way to solve them, which occasionally knocks down the atmosphere a notch or two. All in all, From Dust is an excellent example of how important good art direction and storytelling are even in relatively simple games. If the game mechanic was kept intact, but the game had been done in the humoristic, bright and silly tone of the late 90’s/early 00’s tycoon games, it would have been a big “meh” for me. Now I’m more than willing to overlook the shortcomings of From Dust, and enjoy the feel that what I’m consuming is art, not just entertainment. Seems like it’ll also be available on Steam in a week or two. Tempting.